I am officially having a bad week at work. Yes, I do know it is only Tuesday. Actually I was officially having a bad week at work yesterday. What can I say…sometimes stuff just happens. If you are looking for some fun Christmas inspiration though…check out this card here and then this card here. So anyway…I came home today from work and decided to do something just for fun! I saw the challenge over at CASology (haven’t done that one for a while) and then the color challenge on SCS. So when I put the two of them together…this is what I came up with. I could just see using this card with …sorry inside. Layer onto Diagonal Tangelo Twist striped dsp (Flowerpot dsp) – 1/2 x 5 1/2. 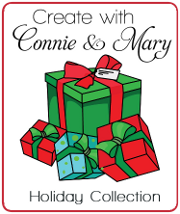 It’s almost time for the Create with Connie and Mary Holiday Collection 2014 where we are featuring the Christmas/Holiday (no Halloween/Fall) products from the Holiday Mini! This entry was posted in Challenge, Clean and Simple (CAS) and tagged Alphabet Rotary Stamp, Gorgeous Grunge. Bookmark the permalink. Fantastic card Mary. Love the colors and the design. Mary, sorry to hear your work week hasn’t been so great (and its only Tuesday). Here’s hoping it only gets better from now on! I love your “oops” card…the splatters are perfect for the sentiment! Thanks for joining us at CASology! Sorry about the the bad that has ruined your week. Hope it improves! Love the card you created. One of my favorite stamps sets is the G. Grunge! I find many uses for the splatters and the lines. Try brushing off the pain of the past two days and move on please. An awesome sorry card – love the platters and the stripes. Hope your week improved! Thanks for playing along with CASology this week!